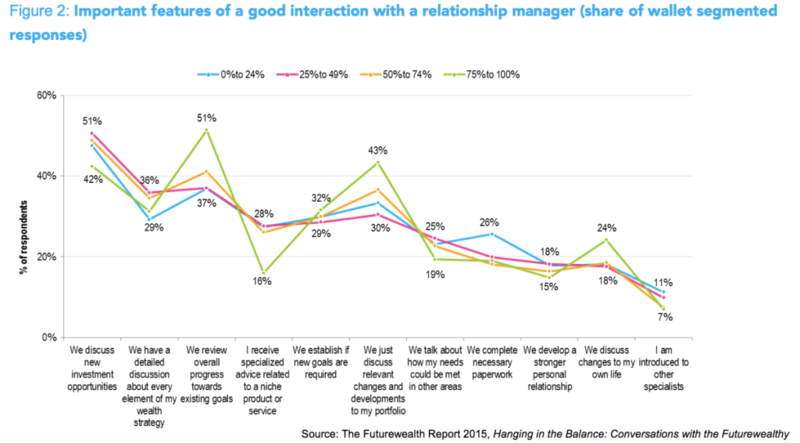 LONDON – High net worth clients say 11 interactions a year is the ‘sweet-spot’ level of contact with relationship managers at wealth management firms, according to new global research released today by NPG Wealth Management, SEI and Scorpio Partnership. The report, entitled Hanging in the Balance: Conversations with the Futurewealthy and takes into account the views of 3,113 investors, has found that when interaction levels dip below this level, clients are more likely to give a negative review of their experience. The Futurewealthy who give a satisfaction score of ‘moderate’ or ‘poor’ typically see their relationship manager 9 and 6 times a year respectively. By contrast, those citing ‘good’ or ‘very good’ satisfaction levels believe they are getting the attention they need, hearing from their key contact 11 and 12 times annually. Product and service specialists also play a supporting role in the client contact strategy, typically interacting with them seven times a year. Across all products and services, 49-58% of the Futurewealthy want either periodic or regular access to specialists, with access levels fluctuating depending on product complexity. As a result, lending solutions, hedge funds and estate planning services are the areas where experts are most widely used. There are also cultural influencers over the contact strategy. In the Americas, communication with a specialist occurs roughly four times a year. This rises to five interactions in Europe and bounces up to ten times a year in Asia Pacific. The results also show that almost 60% of the most financially invested clients (those with at least three-quarters of their assets at a wealth management firm) prefer all product and service discussions to happen with their relationship manager. By contrast, just 9% of those with less than a quarter of their wealth at a firm want to interact with a relationship manager, instead choosing to engage with specialists or a digital platform. “The role of specialists in the client contact strategy should not be underestimated. Not only are they frequently in front of the client, the research highlights that experts enhance the relationship because they deliver access to new opportunities, as well as technical knowledge and informative content” commented Marc Stevens, Chief Executive Officer of NPG Wealth Management. The rise and rise of robo-advice has left many industry commentators questioning – is the relationship manager still relevant in the wealth management delivery model? According to the latest global HNW research from NPG Wealth Management, SEI and Scorpio Partnership, this traditional contact strategy is not just alive but thriving amongst the most highly engaged clients. The results show that almost 60% of the most financially invested clients (those with at least three-quarters of their assets at a wealth management firm) prefer all product and service discussions to happen with their relationship manager. By contrast, just 9% of those with less than a quarter of their wealth at a firm want to interact with a relationship manager, instead choosing to engage with specialists or a digital platform. “For those who are most deeply invested in their wealth management relationships, the human interface is still the ballast of a communications strategy. This isn’t simply about having good people on the front line but about understanding the nuances of a good conversation from the perspective of the global wealthy,” commented Sebastian Dovey, Managing Partner of Scorpio Partnership. Brett Williams, Managing Director, SEI Wealth Platform, U.K. Private Banking added “Wealth management firms need to identify the optimum level of contact between relationship managers and their clients, and strike a balance between technological enablement and established ways of working. Our research is clear in that it is important not to overlook traditional face-to-face contact as a key relationship-building tool for wealth managers, even when new technology is introduced. To clients with a larger proportion of their wallet at a firm, a good interaction means the relationship manager acts as a filter, only delivering insight that is relevant to their client’s objectives. Over half of those with a relationship value of over 75% of their assets say they want an overall progress review and 43% of them want to discuss relevant portfolio changes. This compares to 37% and 30% of clients with a lower financial investment. In total, 3,113 individuals took part in this fifth global poll of the Futurewealthy. The average level of wealth among these individuals was USD2.7 million. Geographically, 36% of the sample group live in Asia Pacific, 46% live in the Americas and 17% live in Europe. The research was conducted using an online survey. Participants were identified using profiling techniques to determine their likelihood of qualifying as Futurewealthy candidates. They were contacted directly by email. The research was conducted by Scorpio Partnership in collaboration with NPG Wealth Management, and SEI. Scorpio Partnership is a pioneer in the art of translating the complex needs of wealthy clients into practical, innovative and profitable solutions to target these customers. This award-winning firm has developed client insight from thousands of millionaires and billionaires around the world. With this knowledge, the firm has implemented strategic research, practical consulting and business innovation projects in over 35 countries. SEI (NASDAQ:SEIC) is a leading global provider of investment processing, investment management, and investment operations solutions that help corporations, financial institutions, financial advisors, and ultra-high-net-worth families create and manage wealth. As of March 31, 2015, through its subsidiaries and partnerships in which the company has a significant interest, SEI manages or administers $648 billion in mutual fund and pooled or separately managed assets, including $258 billion in assets under management and $390 billion in client assets under administration. For more information, visit seic.com.